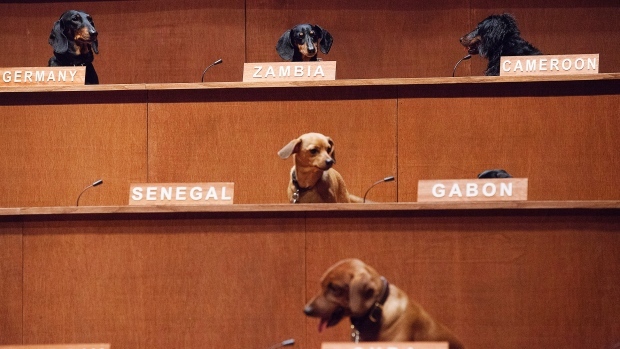 Dachshund UN, a "a miniature version of the United Nations Commission on Human Rights where the world's leaders are replaced by dogs", has opened in Toronto and runs through March 4th. 38 dachshunds represent the United States, Canada, France, Germany and other countries. 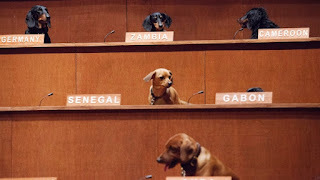 Australian artist Bennett Miller chose dachshunds because they come in so many varieties of color and fur (akin to the racial makeup of the real UN) and because they "are impressive but restricted, you can match that to the United Nations".